A floating star wandering the universe closely watched over Stella, its formidable matriarch, Cazino Cosmos brings up the original game mechanics introduced by Yggdrasil for the first time. Your space-themed adventure goes over 5 reels, 3 rows, and 20 paylines coming with a big win of 11821x your initial stake. Moreover, there would be more than enough collectible Wilds on each new spin, tons of Free Spins and Sticky Wilds to satisfy everyone’s taste. Tempted to learn more? 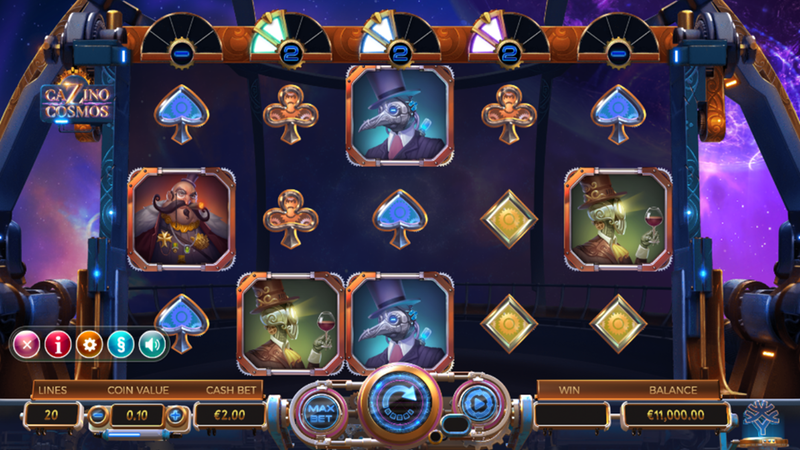 Read the Cazino Cosmos slot review. Tired of reading? See the Cazino Cosmos screenshots below and then claim one of the bonus offers of our recommended casinos to play for free or real! Before actually enter this cosmic establishment, you have to decide will you play for fun or for real money. In terms of the gameplay, both modes come with the same set of rules. Still, the Cazino Cosmos Free Play is packed with demo credits so you won’t have to invest a dime in order to learn how to win. Also, this could be the fastest way to define your betting strategy. The paytable is bundled with 4 low-paying and 4 symbols with a higher payout rating, all of them designed to match the ambiance. The first case scenario, naturally, brings a lower amount of cash, while themed icons such as the funny-looking bearded space general pay a maximum of 100 coins for a combination of 5 of a kind. You can use Stella as the Wild and replace all other items, but the Scatter. Also, Wilds has an important role in the Cazino Cosmos Bonus round. Try to fill an entire reel out with 5 Wilds to initiate the Collection Free Spins Feature, so depending on the collection you actually fill out, enjoy one of the following: Card Shot Free Spins with 2 random Sticky Wilds, Hack Free Spins with 5 extra rounds, Zero Gravity Free Spins with Nudge Reels, Mutation Free Spins where 1 randomly-chosen higher-paying icon transforms into Wild, and Expansion Free Spins when all new Wilds form Stacked Wild Reels. Finally, the coin value goes between €0.10 and €20, so there’s plenty of room for both players on a budget and high rollers to place bets according to their experience and ambitions. Collect 3, 4 or 5 Scatters appearing anywhere on the reels and you will be rewarded with 10, 15 or Cazino Cosmos Free Spins, respectively. All Wilds showed up will turn into Sticky Wilds to help you produce more winning combinations, while each new Wild comes with 5 additional spins. This is an iSense 2.0+ slot that you can play online using any mobile device on Yggdrasil sites. There is no need to download the iPhone app or the Android .apk file. 3. What is the RTP factor of Cazino Cosmos? The official RTP info states the figure of 96.00% and is added to our Cazino Cosmos tutorial. Promising more than a quality entertainment and winnings like not from this world, the space opera has what it takes to keep you awake on long gaming sessions. Colorful and explosive, the title does favor a house, so you can rely on our Cazino Cosmos tips and overcome any trouble.